Facebook?s Oculus wants to get 1 billion people into virtual reality, but consumers might think twice about embracing the technology if they see a high price tag. Now, Oculus is trying to make virtual reality more affordable for the masses. On Wednesday, Facebook CEO and co-founder Mark Zuckerberg said Oculus will be releasing a new virtual reality headset for $199 next year that doesn?t need to be tethered to a computer. The headset ? 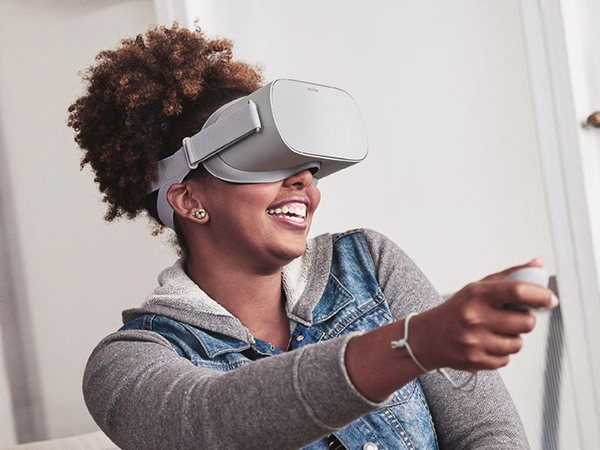 called Oculus Go ? will be higher quality than the cheaper Samsung Gear VR, which is designed to work with a smartphone. Oculus has been trying to find a ?sweet spot? when it comes to the price and quality of a virtual reality headset. The company also slashed the price of the Oculus Rift and touch controllers, which require a high-end personal computer, from $499 to $399 on Wednesday. ?We believe that one day, almost everybody is going to use virtual reality to improve how we work, how we play and how we connect to each other,? Zuckerberg said at Oculus? annual developer conference in San Jose. From exploring new places to conducting meetings in virtual reality, the technology isn?t just about recreating real life, but ?imagining the world as it could be,? the tech mogul said. But access and price are just some of the hurdles Oculus faces as it tries to make virtual reality mainstream. Developers will also need to create more compelling content outside of gaming. Lowering the price helps increase access to the technology, but it?s still unclear if consumers will start using virtual reality in their daily lives like they do with their smartphones, experts say. ?The shift from the computing environments that we have today, which are by and large a flat screen, to ones that are immersive screens is going to be the most challenging technology shift that we will likely ever face,? said Brian Blau, an analyst at Gartner. Facebook has high hopes that virtual reality will become the next computing platform. The social media giant bought Oculus in 2014 for $2 billion and paid another $1 billion for employee retention bonuses and other deals. Through the use of virtual reality, Facebook envisions a future in which its users will be able to experience moments shared by their friends and families, such as birthdays or a baby?s first steps, like they?re there in real life. But the tech firm still has to convince consumers that buying a virtual reality headset is worth the price. The new Oculus Go headset has better visual clarity than a mobile headset like the Samsung Gear VR, but is also comfortable because it?s lightweight, said Hugo Barra, who leads virtual reality efforts at Facebook. ?Building VR headsets requires a fundamentally different approach compared to any other consumer electronics. You really have to understand how the human perceptual system works and you need to learn how to convince the brain,? Barra said. Oculus, though, has faced other challenges including shipment delays, a leadership shuffle, the departure of a co-founder and an intellectual property theft trial. This week, Zuckerberg apologized for offending some users after he visited a flooded Puerto Rico in virtual reality through the use of a cartoon avatar. Spending on augmented reality and virtual reality products and services is expected to grow worldwide from $11.4 billion this year to $215 billion in 2021, the International Data Corporation said in August. Oculus executives expressed confidence that their bets on virtual reality will eventually pay off. ?This is going to happen,? said Oculus? Chief Scientist Michael Abrash. ?It?s really a question of how quickly it happens because it?s not technological impossible and it is so powerful that it will happen. ?